Perhaps the most versatile of modern creative artists, Indian or Western, not excepting T.S. 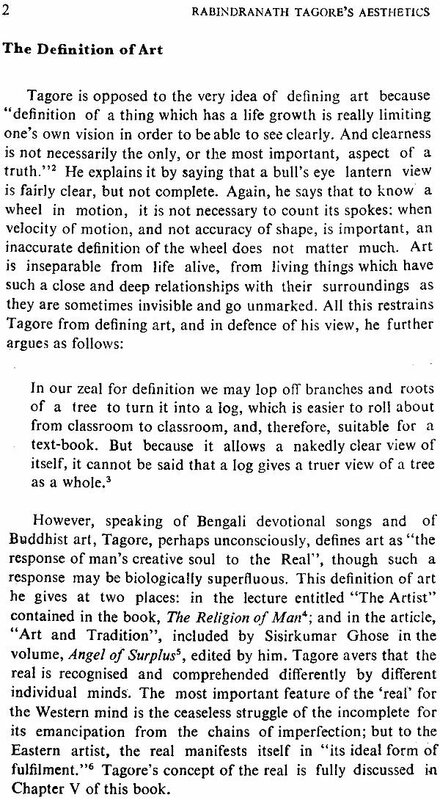 Eliot and D.H. Lawrence, Tagore doubtless offers us a fairly profound and elaborate aesthetic theory, though, of course, he does not write about art and literature with the deliberate intention of a writer of aesthetics. 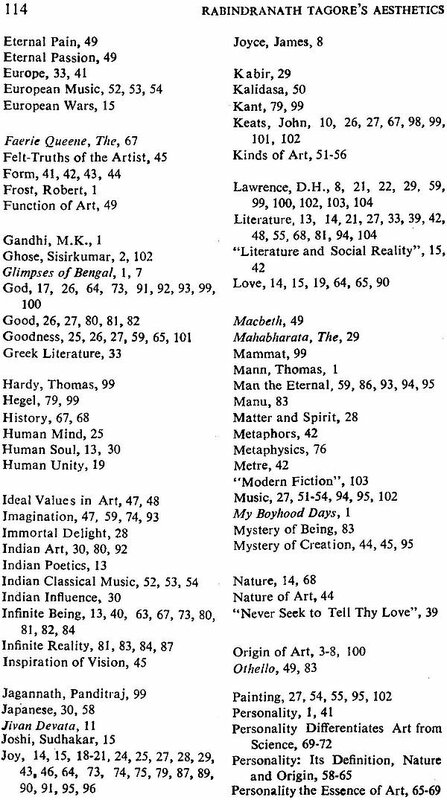 From a systematic, close study of the pronouncements and cogitations on art and literature, scattered in his variegated writings, emerges an aesthetic philosophy, which is absolutely invaluable to apprehend and appreciate his creative mind as well as the Indian and Western arts and literatures. Much of the finest of the Indian and Western aesthetics has been retouched and modernized by him, and to this he has contributed considerable by dint of his original mind. Hence the need and justification for a book such as this. 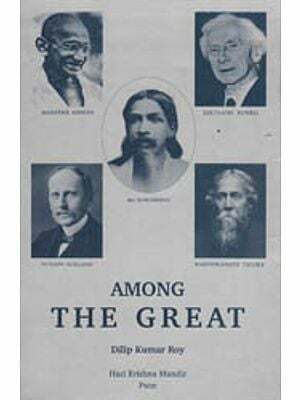 There is almost a plethora of critical studies on the various aspects of Rabindranath Tagore's mind and art. But, curiously enough, only little attempt has hitherto been made to assimilate ad assess his theory-statements on art in detail. This paucity of work further necessitates a thorough exploration of this subject. The present book is an attempt to meet this need. A comprehensive study of Tagore's aesthetics, the book, it is hoped, will surely help the reader to understand Tagore, art and literature correctly. K.K. Sharma, M.A. Ph.D., D.Litt., is Professor of English at the University of Allahabad. He is well-known for his books and articles both in India and abroad. Some of his notable full-length studies are: Joyce Cary: His Theme and Technique, Modern Fictional Theorists, Bhabani Bhattacharya: His Vision and Themes, Tradition in Modern Novel-Theory, The Partition in Indian English Novels, Indo-English Literature: A Collection of Critical Essays (Ed. ), Perspectives on Mulk Raj Anand (Ed. 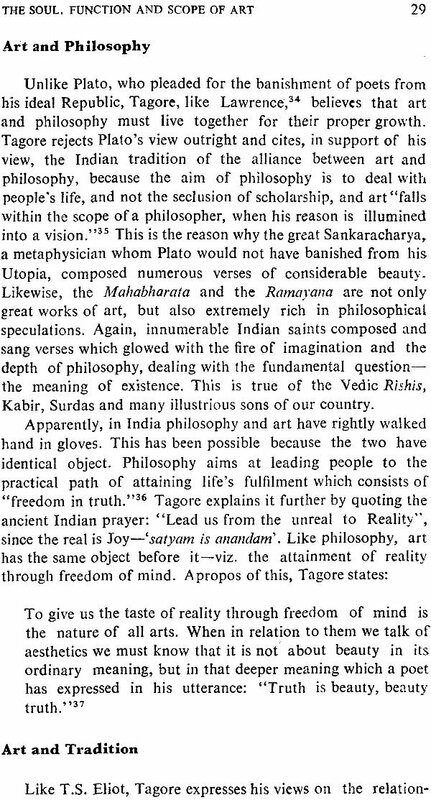 ), Perspectives on Raja Rao (Ed. ), and Indian English Literature: A Perspective (Ed.). Rabindranath Tagore is incontestably one of the greatest literary luminaries of the world, and it may be said without the least exaggeration that his name is already written on the imperishable rock of time. His many-sided and many-splen- doured genius caught the fancy of quite a large reading public, creative artists and academics both at home and abroad as early as the beginning of the present century. He suddenly rose to greatness as soon as he came in contact with English men of letters, particularly W.B. 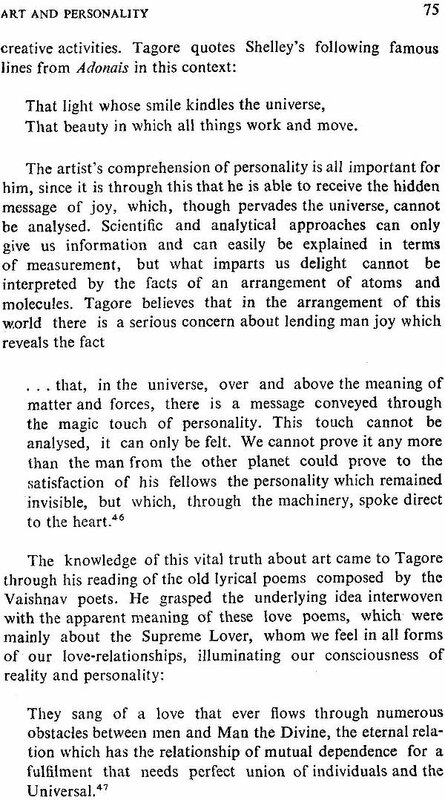 Yeats who was simply bewitched by his lyrics, collected in the volume entitled Gitanjali, No wonder he was honoured by conferring on him the Nobel prize for literature in November, 1913. 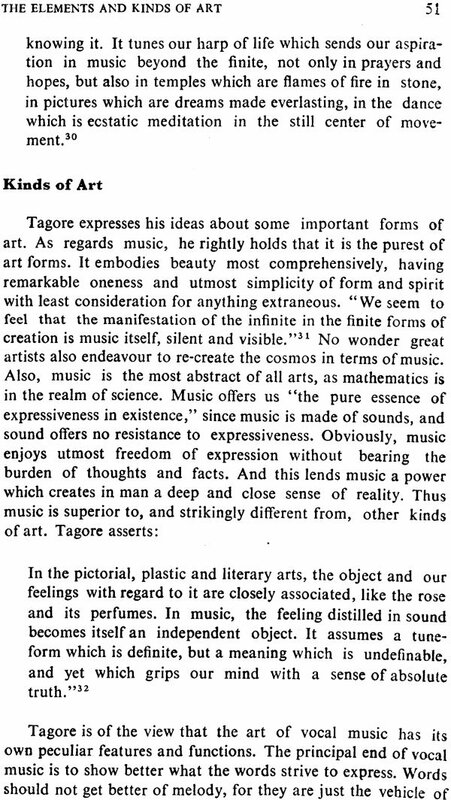 An artist in the most comprehensive sense of the term- poet, fictionist, dramatist, painter, musician, essayist, educationist and philosopher rolled into one-and steeped in both ancient and Western arts, literatures and thoughts, Tagore has undoubtedly propounded a significant aesthetic theory. 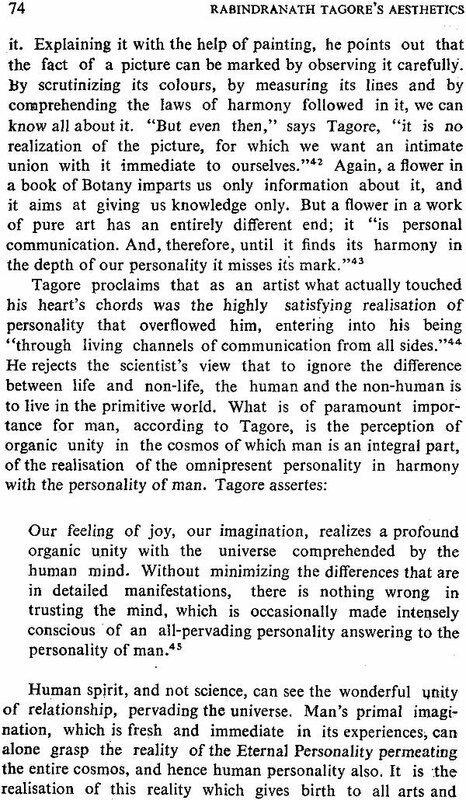 From a systematic, close study of his pronouncements and cogitations on art and literature, scattered in his variegated writings like Personality, Sadhana, Creative Unity, The Religion of Man, Towards Universal Man, Reminiscences, My Boyhood Days, Glimpses of Bengal, Angel of Surplus, A Tagore Reader, Letters, etc., emerges an aesthetic philosophy which is absolutely in- valuable to apprehend and appreciate his creative mind as well as Indian and Western arts and literatures. Hence the need and justification for a book such as this. 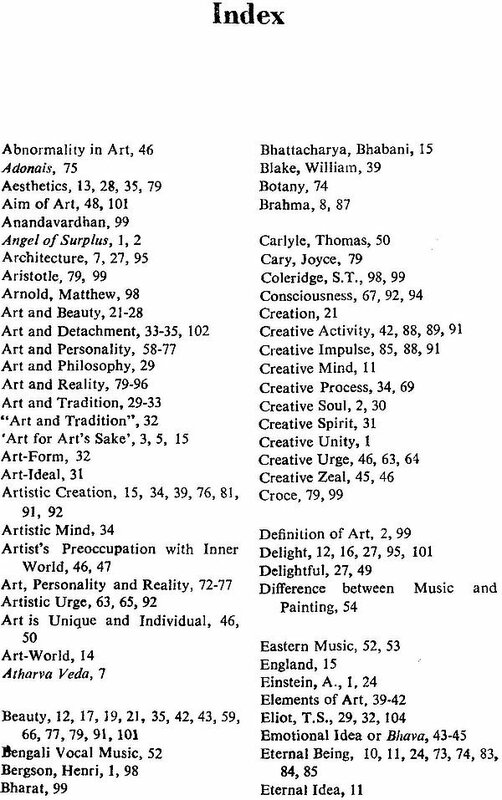 There is almost a plethora of critical studies on the various aspects of Tagore's mind and art as is evident from the select bibliography appended to the present study. Still, strangely enough, only a little attempt has hitherto been made to assimilate and assess his theory-statements on art in detail. I have been able to find just two studies entitled The Volcano: Some Comments 011 the Developments of Rabindranath Tagore's Aesthetic Theories and Art Practice by Mulk Raj Anand and Tagore on Literature and Aesthetics by P.J. 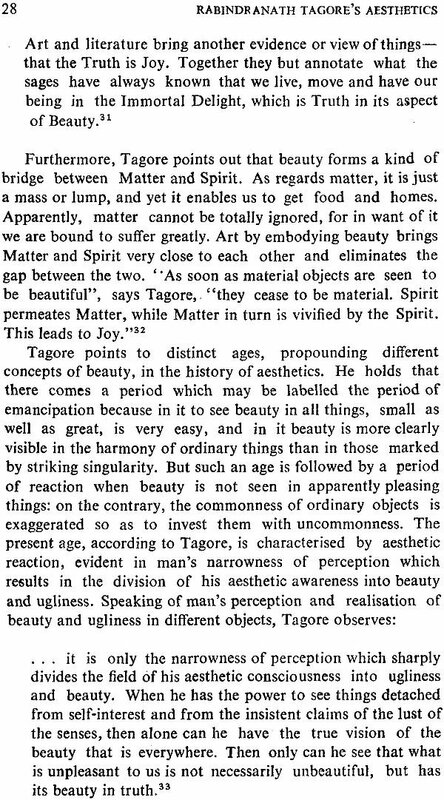 Chaudhary, two admirable articles- "Angel of Surplus-A Note on Tagore an Aesthetics" by Sisirkumar Ghose and "Tagore's Views on Poetry and Art" by V.Y. Kantak-and a few pages only in some books on him. This paucity of work further necessitates a thorough exploration of this subject. The present study has been undertaken to meet this need. 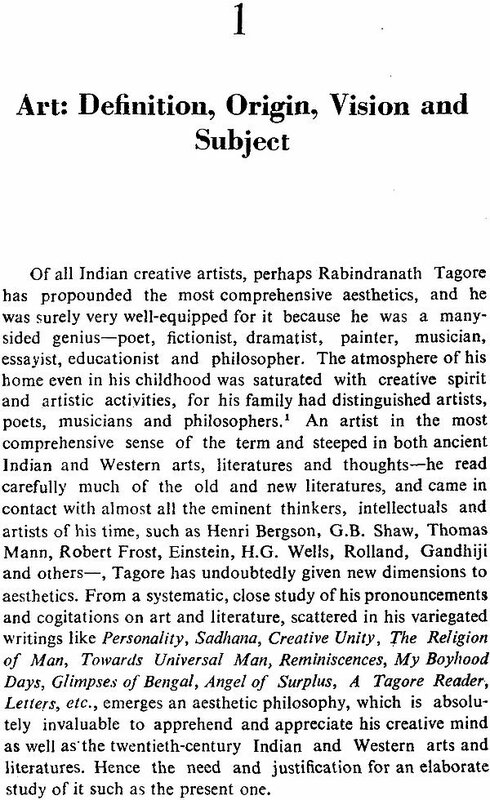 An exhaustive critical analysis of Tagore's aesthetics, the book, it is hoped, will surely help the reader to understand Tagore, art and literature correctly. I cannot close these prefatory remarks without expressing my gratitude to those who have been good enough to help me in the preparation of this book. I am deeply beholden to Professor Sisirkumar Ghose for encouraging and helping me to pursue my plan. To my elder brother, Professor T.R. Sharma, D.Litt., I am greatly indebted (or his constant encouragement to undertake and accomplish the present study. Also, I must admit that but for the affection and joy given to me b) my daughter, Kuhu, the work would have taken at least six months more in its completion. In the end, I acknowledge thankfulness to all the scholars who have written on the subject.